As shown in figure 1, Indian IT-ITeS industry revenue is estimated at USD 151.0 billion in FY2017-18 as compared to USD 141.0 billion in FY2016-17, registering an increase of around 7.0%. The overall industry’s growth of this sector over the last five years is given in the table below. 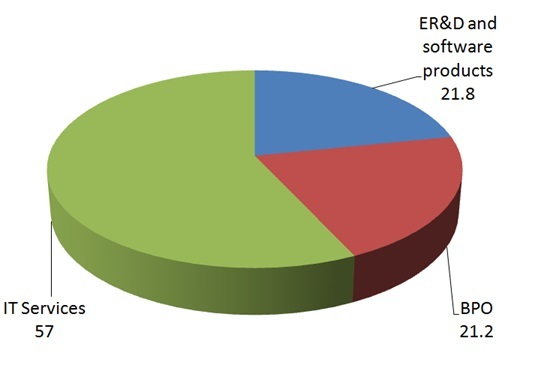 As per figure 2, the IT Services exports accounts for the largest share of 57% of about US$ 86.0 Billion; ER&D and software products has emerged as the second largest segment with 21.8% share followed by BPO exports contributing 21.2%. 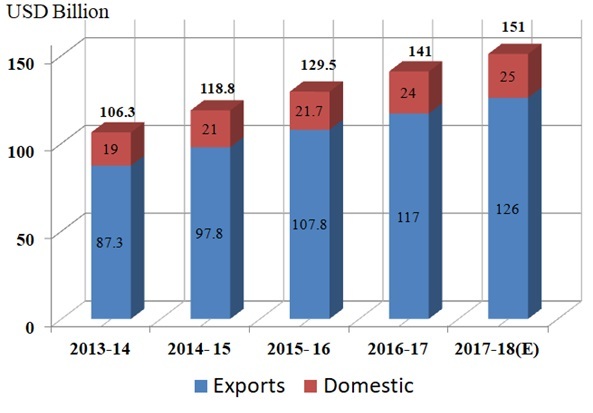 As shown in figure 3, IT-ITeS exports are estimated as US$ 126.0 billion in FY2017-18, growing by 7.7% over FY2016-17. A combination of solutions around disruptive technologies such as SMAC (Social media, mobility, analytics and cloud), artificial intelligence, embedded systems etc. have become the life-force of the industry. IT Services is the fastest growing segment within the Indian IT-ITeS sector. This segment is estimated to generate exports revenues of the order of US$ 69.3 billion in year 2017-18 as compared to US$ 66.0 billion in year 2016-17. 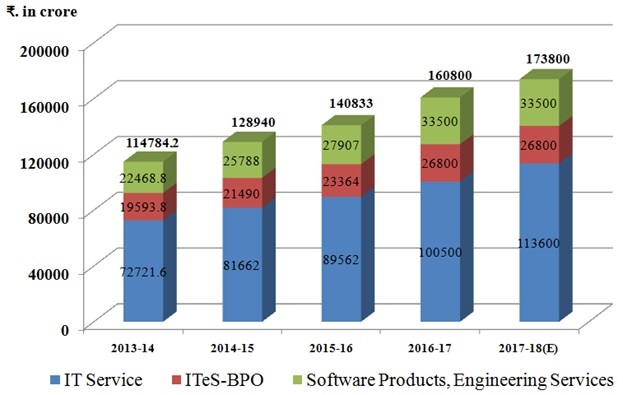 ITeS/BPO segment has been reinventing itself in the past few years and is expected to generate export revenue of the order of ~US$ 28.4 billion in year 2017-18 as compared to US$ 26 billion in year 2016-17. Engineering R&D and Product Development has registered a growth of about 12% in the exports, which is estimated to reach US$ 28.3 billion in year 2017-18 from the level of US$ 25.0 billion in year 2016-17. The Size of the domestic market is become significant now in the IT/ITeS Sector, though it largely remains export driven. As shown in figure 4, Domestic IT-ITeS revenue (excluding hardware) is estimated to reach INR 1738 billion in FY2017-18, as compared to INR 1608 billion in FY2016-17, a y-o-y growth of ~8.7%. In FY 2018, India’s domestic IT-BPM market is likely to grow 7.9% Y-o-Y to reach US$ 41 billion (~₹ 273750 crore), excluding e-Commerce as compared to US$ 38 billion in 2016-17. Rapid digitization is expected to further catalyse growth. Domestic IT-BPM industry is also seeing continued growth as various government initiatives encourage technology usage (push factor) and Indian enterprises across industries are rapidly implementing digital technologies to adapt to a changing competitive landscape and the ever-demanding customer. 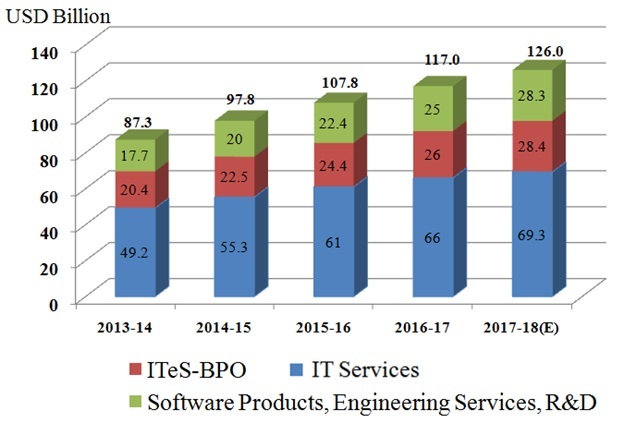 Domestic IT Services sector is the largest segment with close to 40.5% share, expected to reach ₹. 113600 crores in year 2017-18 as compared to ₹ 100500 crores in year 2016-17 with a estimated growth of about 13.1% in INR terms.